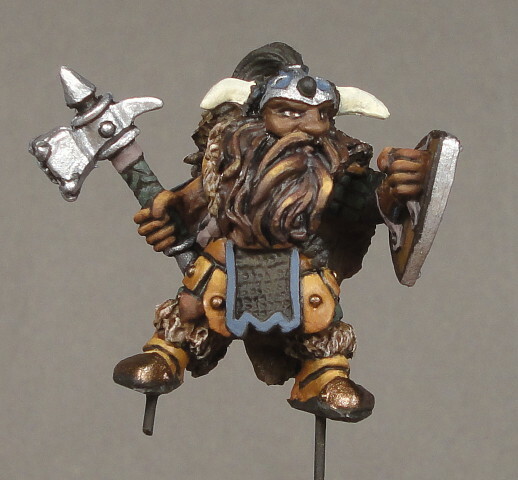 Fulumbar is an exchange miniature for Sirithiel, also known as Project G.
Fulumbar is a plains dwarf, a race of dark-skinned dwarves that farm and hunt the vast plains on the other side of the Dwarf Lord Mountains, where humans and elves rarely venture. 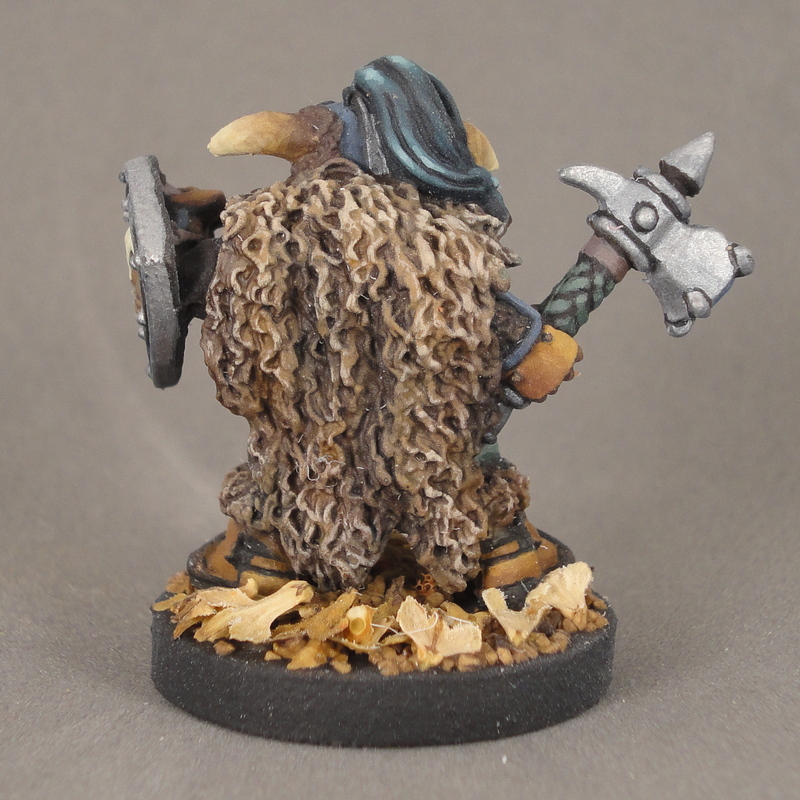 The plains dwarves recognize that not all treasure is found underground – wood, leather, fur, horn, barley and wheat are the precious materials the plains dwarves deal in. You didn’t think that the famous dwarven ale was made with plants grown underground, did you? 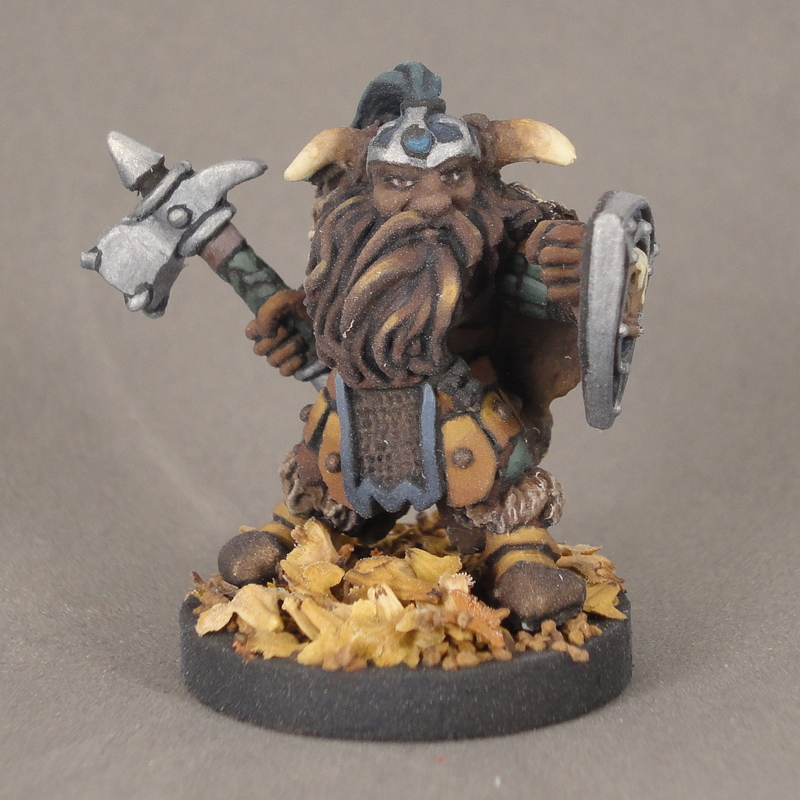 Of course, it’s not shocking that you’ve never heard of plains dwarves before. The mountain dwarves are themselves notorious recluses and even the human towns near the mountains only see the occasional trader, prospector or adventurer. 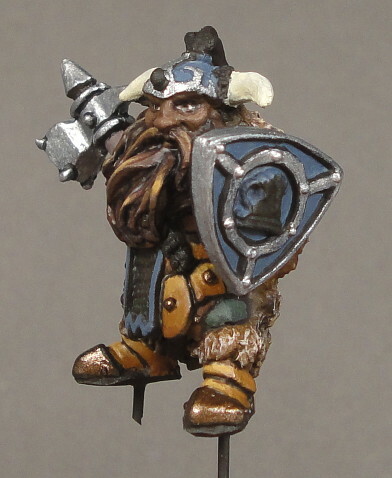 The plains dwarves also keep to themselves, though they’re just as fierce as any king under the mountain when provoked. As for Fulumbar, why does he now travel in human lands? Though he was raised a farmer in the thorp of Bem Lodar, that idyllic life was brutally cut short when duergar raiders burned the village to the ground, killed half the inhabitants and carried off the rest. 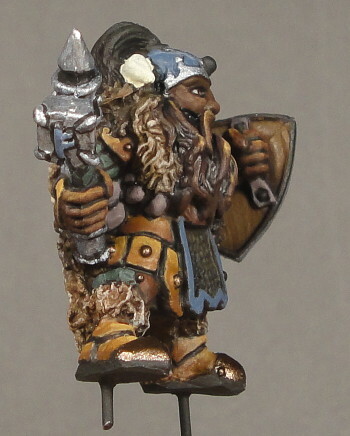 Fulumbar spent the next 20 years chasing the duergar, hunting down their raiding parties and freeing the captives they took from Bem Lodar, until only two remain unaccounted for – his wife and baby daughter, now a young dwarven lass he’s never met. He has followed the trail of blood and rumors of midnight attacks until they led him to the great human city of Dram. Will his quest finally come to end in the dungeons below Kings’ Valley Keep, or will this be another dead end? Fulumbar is finished (minus a matte coat), though I might do some work on the base. It didn’t come out quite how I’d envisioned it, though I woul dneed to be careful not to draw attention away from the miniature. Work continues on Fulumbar, aka Project G. The face and beard is done, though I am worried the beard looks a bit weird. Did I take the highlights too high, or are there not enough locks of hair that are highlighted? 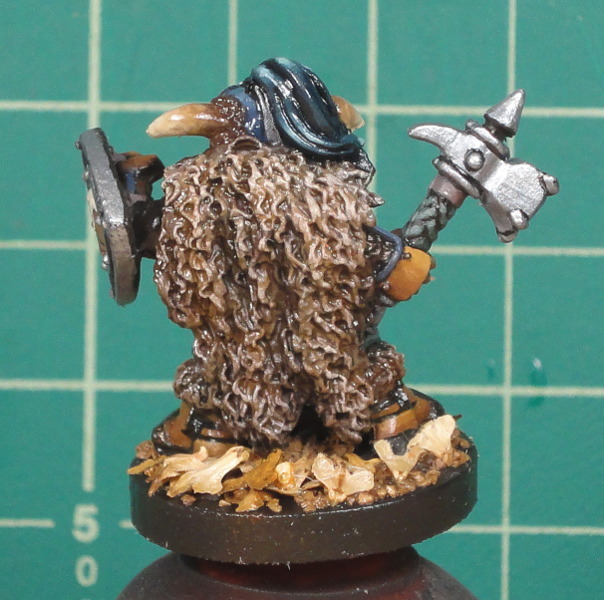 The metal bits of his hammer, shield and helm are metal – attempting some light TMM though it doesn’t show in the pictures. Leather bits of armor are detailed. Hammer haft, horns and pouches got a base coat. 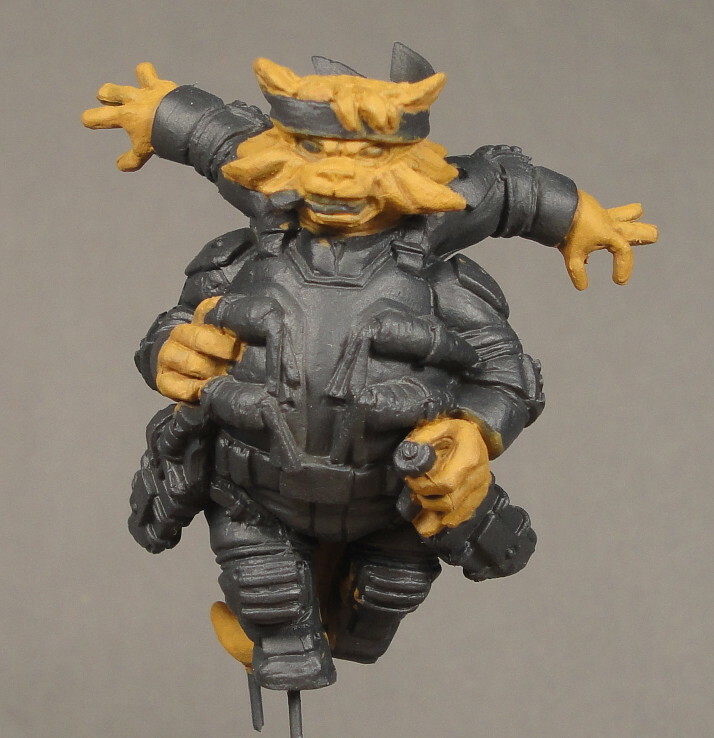 The hair on the helm is the last bit that needs basecoating – I’d like to use a cool color to tie in with the blue, but not sure how to not make it look ridiculous. Then detailing for all those bits, plus the chain parts of his armor (drybrush metallics?) 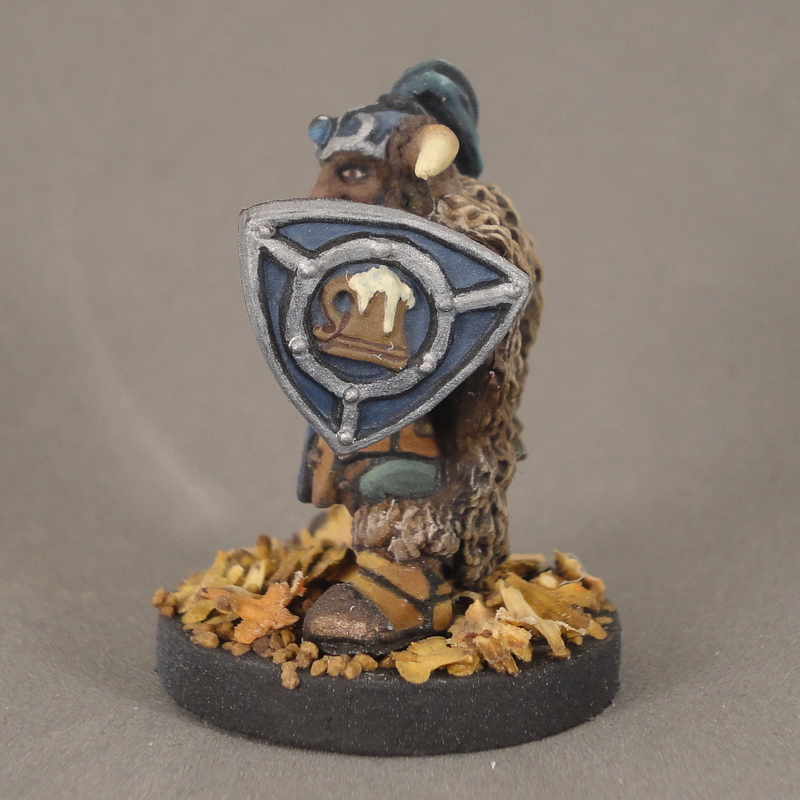 and the beer stein on his shield. 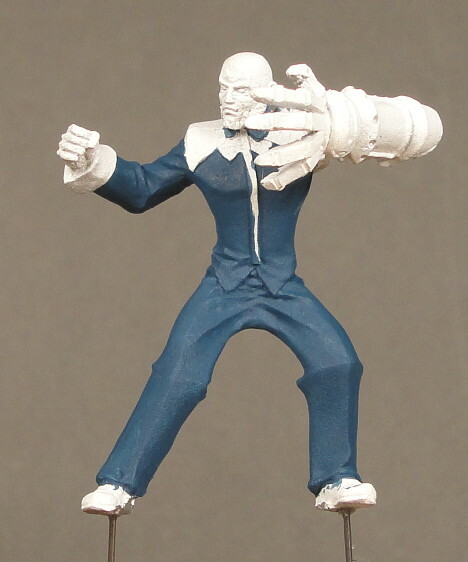 I started work on Reaper Miniatures 77011: Fulumbar Ironhand today. The material is Bones plastic, primed with MSP Brown Liner. Other colors used are shown in the photo. 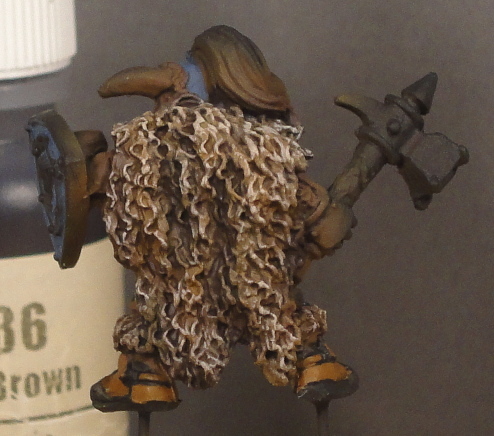 The base of the cloak was several different browns airbrushed on, followed by a brown wash and a bright highlight. 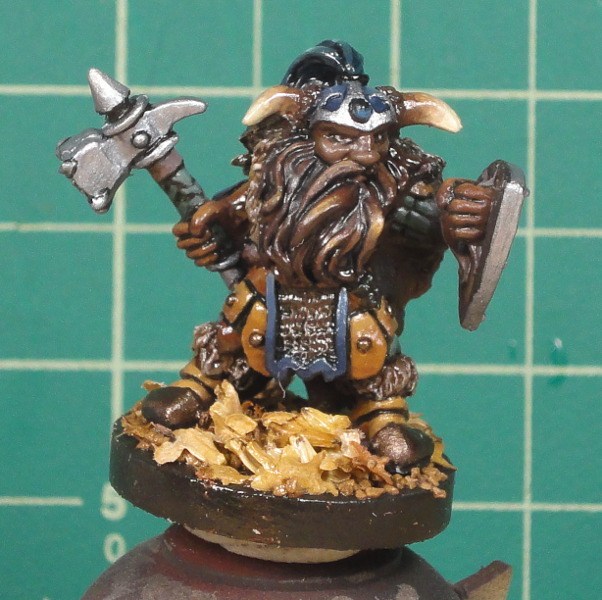 My partner is Sirithiel, who asked for a dwarf, and for cool colors. 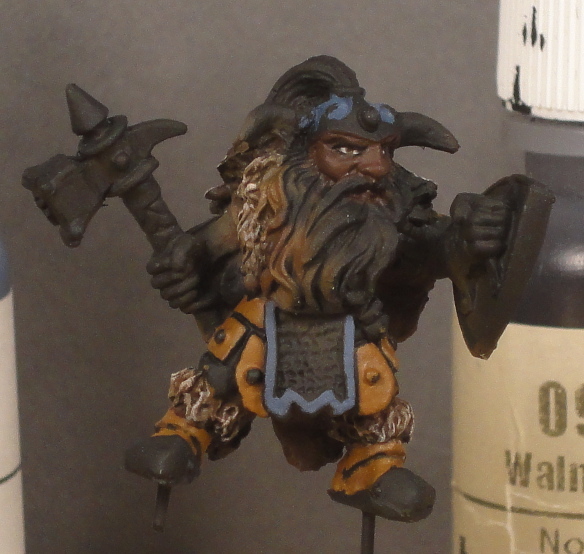 I’ve got the dwarf part down, but cool colors are going to be hard to pull off – right now it’s just some blue accents, but I will try to mix in some other cool colors, maybe on the hammer or helmet. 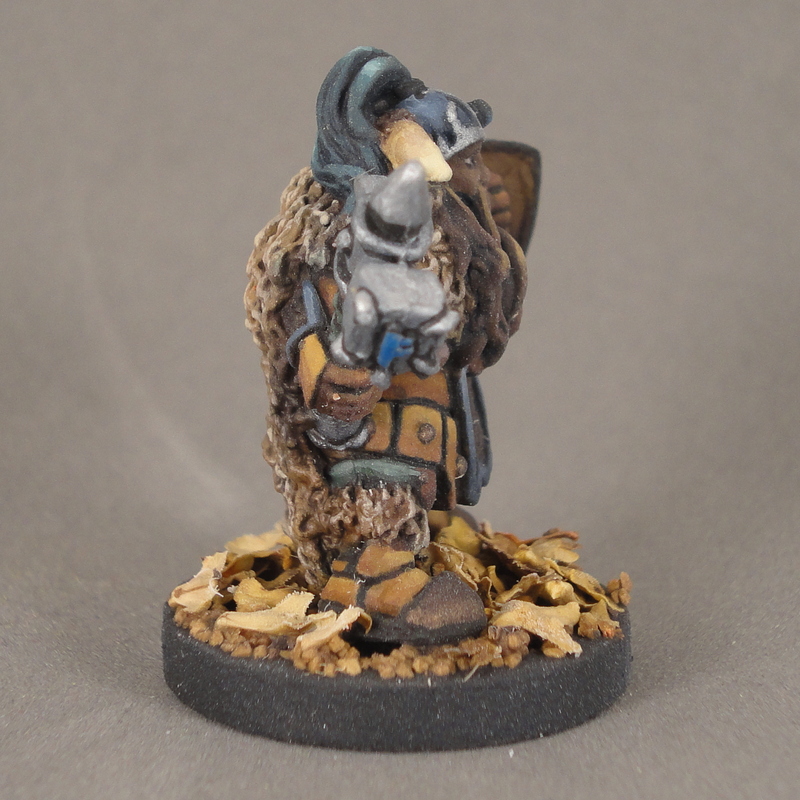 I started Project G today, my miniature for the Reaper Forums Fall 2014 Miniature Exchange. I’m keeping things anonymous for now, but will upload WIP images once the project has reached my partner. I got basecoats on the face (including eyes) and some of the armor. 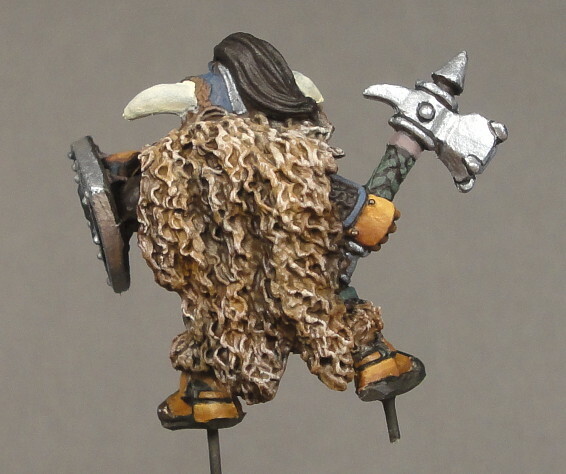 I did the cloak (a fur cloak) using the airbrush for base coats, then wash/drybrush to finish up. I am pleased with the progress so far.